Ben Christen » Blog Archive » sxsw is a blast! I’m at sxsw now — wow, Austin is a fun town. 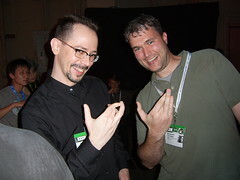 Here I am throwing the Ajax sign with none other than Jess James Garrett – the originator of the term (Ajax) itself! The sign is thrown asynchronously (of course). I was also at etech last week and I showed up at BarCampLA for friday night. It’s been a whirlwind of tech conferences and I LOVE it! It will take the rest of the week to formulate my notes into legible blog posts and my head is swimming with ideas. ETech was great, the presentations were all well done, the food was great and there was a wealth of very technical information and lots of tech all-stars. SXSW is less technical (on the in-depth level) but more fun and loose. The same level of all-stars are here, but they’re more from the blogging world and the design/ia/tech manager world. I’m doing my best to eat BBQ for every meal and I may be leaving town with new cowboy boots (which is weird for me, since I’ve always eschewed them growing up in Nebraska). Hopefully more detailed/focused posts to come. This entry was posted on Sunday, March 12th, 2006 at 1:10 am	and is filed under Uncategorized.